How To Help Your Agent Help You! As a parent you play a vital role in your child’s career. It is important that you update all facets of your child’s AT2 profile on a regular basis so your agent can ensure the right information is passed on for all opportunities. Time is of the essence in this industry with jobs turning over quickly, so the more progress updates the better! We have put together a checklist for you to ensure you are on track and filling in your child's AT2 profile in the best way possible. NOTE: Your agent may have pre-filled in some of the below sections. Select Ethnicity - this field is highly important. Note: you are able to tick more than one ethnicity. Select Hair Length - please update regularly in accordance with hair cuts. Away Status - when you are unavailable, such as going on a holiday, we recommend filling in this section so our casting department know when you can’t attend castings. Measurements - Fill in ALL fields. Update measurements & sizes every 6 weeks if your child is under 3 years and as often as possible for all other ages. For a detailed explanation of taking measurements and sizing we encourage you to read our previous blog 'A Fool Proof Guide to AT2 - Part 2' . You have 10 spaces on your profile to upload photos. These can be happy snaps from home, professional shots or skill related shots (eg; playing piano or dancing) and they can be taken on your phone. You MUST be able to see their body and face clearly in the images. For instructions on how to take great head and body shots check out our previous blog 'How to take the perfect natural head and full body shot' and for how to upload check out 'A Fool Proof Guide to AT2 - Part 2'. It is a good idea to upload a resume containing name, education, list of jobs, castings and extra curricular activities/classes on your child's profile. If your child does not have vast experience a letter can also be great option and is a unique way to show off your child’s personality. 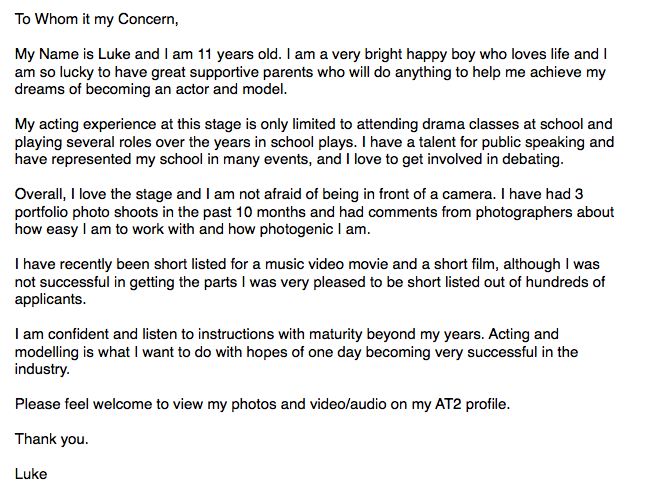 Check out the following example written by Luke as a guide. Ensure resumes and letters are updated regularly according to your child's developments. For detailed instructions on what to include and how to upload a resume check out our previous blog 'A Fool Proof Guide to AT2 - Part 3'. It is vital that you fill out this section, clients often look for specific skills for a campaign, so the more they know the better! We suggest that you record a chat to camera of your child and upload it to their profile. This will provide clients with an insight into your child’s personality and show off their ability in front of the camera. For hints on how to create a chat to camera and upload to AT2 please read our previous blog 'Hits and Tips for how to film a chat to camera'. If you require any help with any aspect of AT2 please contact Bettina HQ via the email address: info@bettina.com.au or call our office on 1300 888 611.